Things have been strangely silent since I reported on July 6 on the $25 million allocation for a possible Millersburg intermodal shipping hub that Rep. Andy Olson got approved as part of the legislature’s transportation law. But it won’t be quiet long. Linn County Commissioner Roger Nyquist was involved in he early discussions about this project, which would make use of the vacant site of International Paper’s former Albany Paper Mill. A few days ago I asked him what was happening and what the next steps would be. 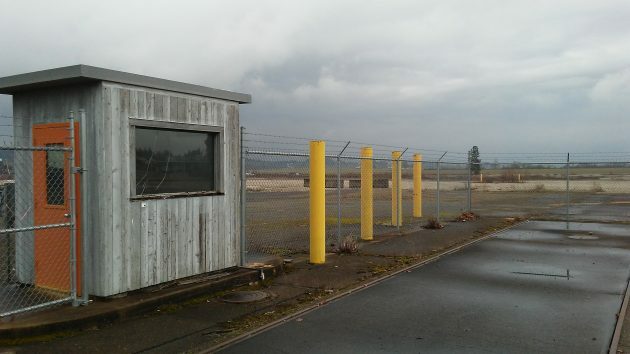 In Millersburg, meanwhile, City Manager Steven Hasson said the city council may take up the “development of a Mid-Willamette Valley Transmodal Facility,” which is what the legislature called it, at its next meeting starting at 6 p.m. on Aug. 8. If real estate acquisition is the topic, chances are the council will go into an executive session where the public is barred. There’s always somebody that brings up the NIMBY objection. If you want your neighborhood never to change, relocate to the Idaho badlands or Wyoming wastelands or something. Otherwise, prepare for change. It’s inevitable. If this proposal goes through, those of us using Old Salem Rd. will have traffic coming north from the site and coming south from the truck stop that will create problems due to congestion. Added to this, between 54th St. and Clearwater the hump in the road makes it hard to see the traffic coming and the 50 MPH speed limit doesn’t seem to be working. Just curious what Union Pacific Railroad’s take on this site is? Will the facility be adequate to assemble a unit train of double stack containers? Only if a new I-5 interchange is built at Conser Rd NE. Otherwise, Old Salem Rd and its two current interchanges becomes the new Brooks with the addition of this and the new Loves Travel Center. It is time for the City of Millersburg to start thinking about the residential impact while it is aggressively “Linking Agriculture with Industry”. Well, our Mayor is for it, all the other politicians listed in various articles are for it…..so it will probably happen. No one seems to ever care or even ask the home owner’s what we think about any project. The homeowners are forgotten in this town. Albany use to be known as the arm pit of Oregon (they took the blame for Millersburg). We will be known in the future for diesel fumes and terrible traffic congestion. I hope the community involves itself and helps find a tenable option. The attitude that the worst is going to happen, most definitely will, if the citizens stand on the side or approach the decision makers with hostility.